Cain Vineyards is a child of the 1980’s. The winery was founded in 1980 when Jerry Cain and Joyce Cain made a purchase of 550 acres on Spring Mountain. Much of the land in those days was being used as pasture land for sheep. In fact, the land purchased from the McCormick Ranch had been used for ranching since the 1870’s. Located in prime soils, with an amazing vista, they quickly began cultivating their vineyards with all 5 of the main Bordeaux grape varieties, Cabernet Sauvignon, Merlot, Cabernet Franc, Malbec and Petit Verdot. 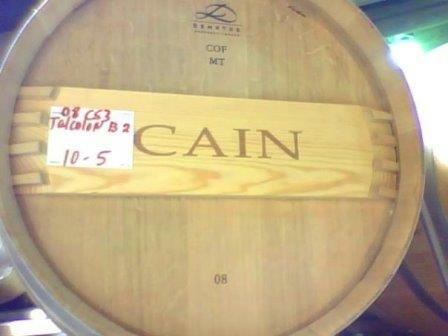 It’s easy to see where Cain Vineyards found the inspiration for its flagship wine, Cain Five. It took 2 years before Cain Vineyard finished constructing their winery and cellars in 1982, which fortunately was just in time for their first harvest. However, with vines that young, it took a few years before they were ready to produce and release their wine for sale. Their first wine, Cain Five made its debut with the 1985 vintage. Cain Vineyards took on partners to help further the development of the winery, Jim Meadlock and Nancy Meadlock. The Meadlock family became part of Cain Vineyards in 1986. 5 years later, in 1991, the Meadlock family became the full owners of the estate. The Cain Five Vineyards are located high up on Spring Mountain, with elevations that range from 1,400 feet to 2,100 feet. This affords not only amazing views, but due to variances in temperatures, their parcels ripen at different times, making it tricky in some vintages to achieve uniform quality. Much of the vineyards were replanted in 1995. While Cain Vineyards maintains plantings of all five Bordeaux grape varietals, Cabernet Sauvignon is king here, with more than half of their plantings devoted to Cabernet. At one point, they produced a Sauvignon Blanc, but that wine is no longer being made. Cain Five Vineyards produces 3 red wines today. In total, the estate makes close to 22,000 to 25,000 cases of wine per vintage. Cain Five is their flagship wine. The wine is made from a blend of all 5 of the major Bordeaux grape varieties, Cabernet Sauvignon, Merlot, Cabernet Franc, Petit Verdot and Malbec. Cain Cuvee is made from a blend of two vintages. Cain Concept is produced from purchased fruit. Cain Vineyards are best served at 15.5 degrees Celsius, 60 degrees Fahrenheit. The cool, almost cellar temperature gives the wine more freshness and lift. Young vintages of their red wine can be decanted for 1-3 hours, depending on the character of the vintage. This allows the wine to soften and open its perfume. Older vintages might need very little decanting, just enough to remove the sediment. Cain Vineyards is best served with all types of classic meat dishes, veal, pork, beef, lamb, duck, game, roast chicken, ribs, hamburgers, barbecue, roasted, braised, grilled dishes and stews. Cain Vineyards is also good with Asian dishes, hearty fish courses like tuna, salmon, mushrooms and pasta. Lean, with tartness to the fruits and hints of dryness in the chalky, medium bodied finish. Light in color, medium/full bodied with smoke, licorice, blackberry, earth and coffee. Soft, round textures, with an oaky, crowd pleasing style. Black licorice, dark cherry, black raspberry jam and fudge aromas, supple textures, and a long, round, dark berry and mocha filled finish produce a satisfying blend of all 5 of the main Bordeaux grape varieties. Taking its name from its blend of all 5, of the main red, Bordeaux varietals, Cabernet Sauvignon, Merlot, Petit Verdot, Cabernet Franc and Malbec, this mature wine offered earth, blackberry and cocoa scents. The tannins felt a little rustic and there was a hint of green in the finish along with the blackberry, olives and red berries. I'd drink this sooner than later. Fully mature, with tobacco, licorice and cassis notes, this medium bodied wine ends with tart plum, cranberry and herbal sensations. Starting to fade from its previous high points, the wine offers complex aromatics, but the medium bodied fruit is losing its sweetness and depth. I’d drink this sooner than later.